The "speed ladder" trick is known quite well among the Counter-Strike community, but is important to mention nonetheless. As it's name implies, it involves moving up and down ladders at a much faster speeds. 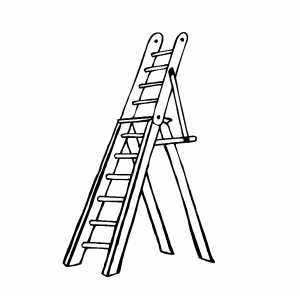 When most new players approach ladders they tend to hold the forward or backward key(s) to move up or down the ladder respectively. What these players don't realize is that Counter-Strike puts more emphasis on the air-speed of strafe movement when compared to forward or backward movement. This is why this ladder trick, bunny-hopping or air-strafing is made possible. Moving quickly up and down ladders simply involves you holding down either strafe keys rather than the forward or backward keys. Make sure to look up or down the ladder with the mouse while holding down the strafe keys and you'll move much faster on the ladder. It's really that simple. Is this trick a glitch? Technically yes. Valve never bothered to fix the effects of air-strafing which leads to bunny-hopping and this ladder trick. Before using these tricks, make sure they're legal in whatever league you are playing in. For those of you that prefer watching videos to reading, you can watch the video tutorial below. Thanks to ManneMannen from You-Tube for posting this tutorial. Crouching on ladders will make your movement completely silent to your opponents. Always crouch when playing with stealth as a priority.